The challenge this week is Primavera ~ The Allegory of Spring. Spring has so many beautiful allegories, but the first one that came to my mind was Easter. I had just gotten down my box of Easter decorations, not even thinking about the challenge and there it was all before me, all the inspiration I needed.. The thing that I was most excited about was being able to use this box. The box with the hole. 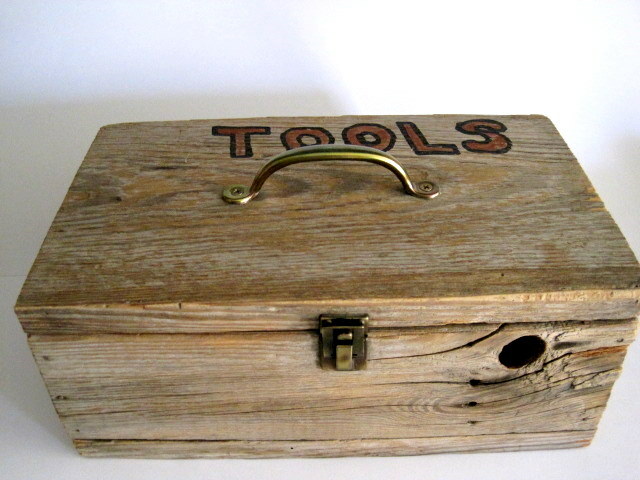 ..Until I decided to use this handmade box to hold some "Tools for Primavera", "Tools for Life", "Allegories for Spring". 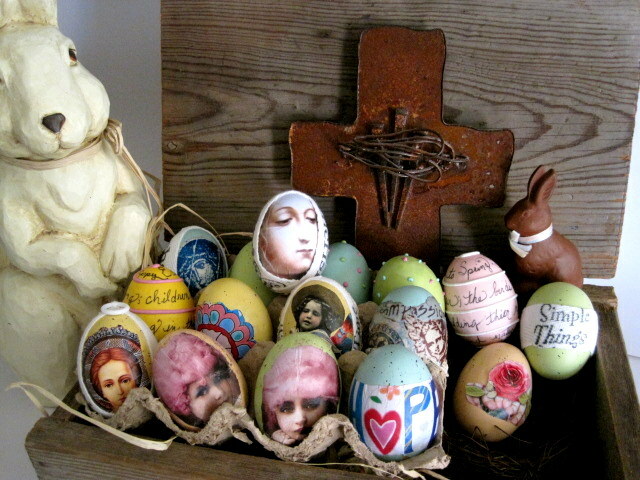 I had so much fun with the collage, painting and decorating these eggs. The Cross is handmade from metal, nails and iron and is a couple years old, but I felt like is was a good fit for the my box. 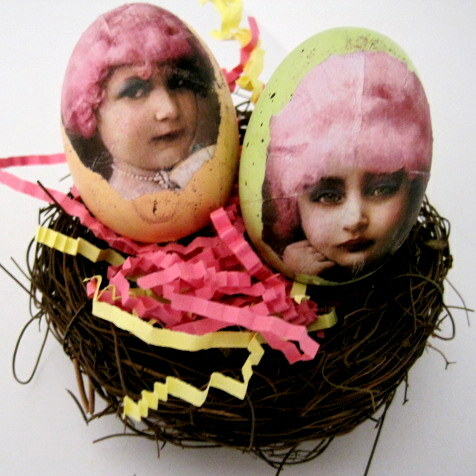 According to an old German story, a poor woman hid some brightly colored eggs in her garden as Easter treats for children. While the children were searching, a hare hopped past. The children thought that the hare had left the eggs. So every Easter, German children would make nests of leaves and branches in their gardens for the hare. This custom was brought to the United States when the Germans came. The hare became a rabbit because there were more rabbits in the United States. Today, it is called the Easter bunny. In England, the goddess of spring, Eastre had an earthly symbol which was the rabbit. She was worship by the Anglo-Saxons through her earthly symbol. The Easter bunny also has to do with its pre-Christian origin. The hare were very fertile animals and gave birth to many offsprings in spring. Therefore , the bunny served as a symbol of new life during the Spring season. The cross was also a well-known symbol before the time of Christ. It was used a special mark on clothes and buildings. However, when Jesus was crucified, the cross became a symbol of suffering. Then with the resurrection of Christ, the Christians saw it as a symbol of Jesus's victory over death. In A.D. 325, Constantine at the Council of Nicaea issued a decree that the Cross is the official symbol of Christianity. I hope you have enjoyed my box of Allegories. Thank you so much for stopping in and remember to "Renew, Re-use, and "Make Room" for Others! Roll over the title of this post to see what is hiding over at Inspiration Avenue. This is very special and original, really awesome! Just amazing symbolism gathered in the box, such interesting and pretty things and ideas! These eggs are so beautiful, and I love the wooden box! 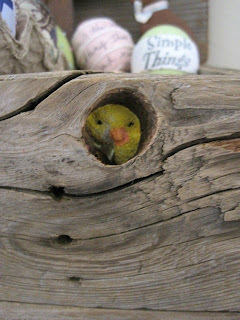 The little chickie hiding in the hole is adorable! I also loved the Easter lore. I didn't know the Easter egg tradition started in Germany. Kim! Do you HAVE to knock my socks off EVERY time? Seriously, kim, I love everything about this yummy post...I don't even know where to start. The box is a treasure and I love the peep peeking through the hole. The eggs are just so unbelievably beautiful! And the story behind the Easter bunny! I am just so inspired by you. Wow, Oh Wow! 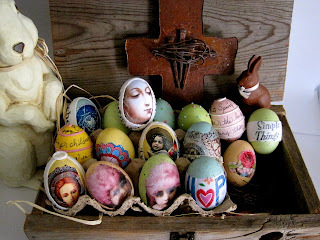 The eggs, cross, & box are just gorgeous. It was such fun to read the story, too! Wow! Very cool.Those eggs are beauteous and the assemblage full on representative of Primavera. Your eggs are so cool. Wow! I love the uniqueness of your interpretation of this challenge. Awww, love your beautiful eggs. 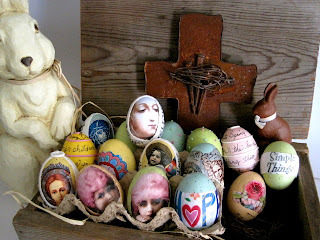 And really love that mixed media cross! Thanks for sharing the history of Easter with us. 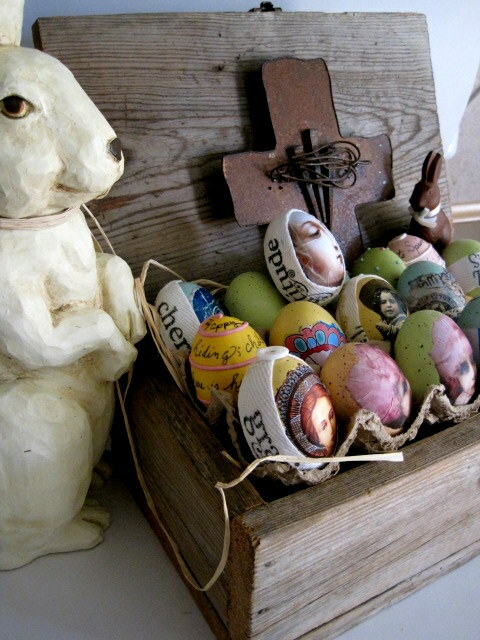 Easter eggs, and the bunny! 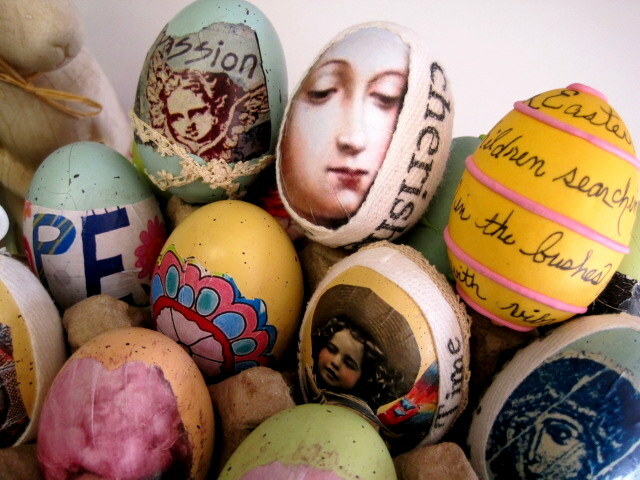 I would have been so excited as a kid to find eggs painted like this. Decorating them with one of my close childhood friends was a favorite activity of mine. 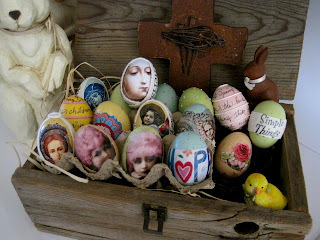 Each egg has beautiful detail, and I love that the bunny by the side watching the scene looks ever so skeptical. This is so cool! I love your box of allegory's and the story behind it! I can't begin to tell you how wonderful I think your box of allegories is. I've looked and looked and see more each time. These eggs are so cute, they must have been so fun to do. I've done Pysenka (Ukranian Eggs) in the past and loved the process and reveal. Thank you for the lovely and flattering comment on my blog, I feel just the same about you. I'm so looking forward to seeing everyone's mail creation from IA. Have a terrific upcoming weekend! I realize I'm nearly a WEEK late getting here, but computer woes have kept me away. 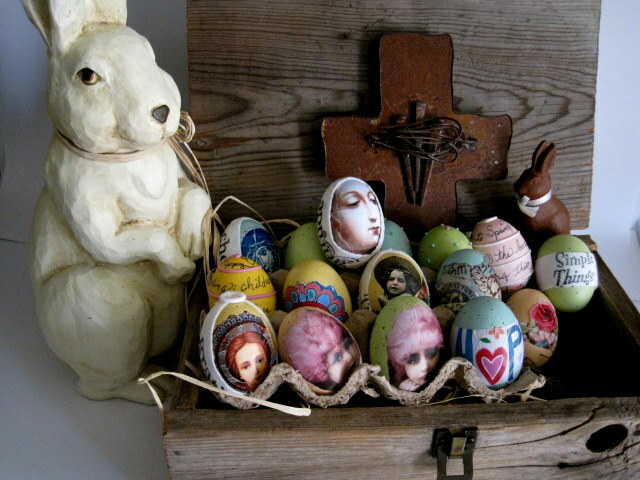 I am in love with this box, the eggs and the hare. I even adore the story of the eggs, which was brought to us in America by the Germans. I'm simply delighted to learn a bit more of our US history and how these customs came to be. Thank you for a very nice lesson and some pretty special art along the way, too!